This is a critical topic – purchase orders (or POs) and their effective usage are a vital component to any successful business. This post is intended to provide both a clear explanation of purchase order processes for beginners, as well as highlight tips for improving these processes for seasoned finance or procurement specialists. Purchase orders are documents sent from a buyer to a supplier with a request for an order. The type of item, the quantity, agreed upon price are generally (should be! ), and po number are printed on the purchase order – the more specific the order, the more details included, the more effective the purchase order will be. When a seller (aka, supplier, vendor, etc) accepts a purchase order, a legally binding contract is formed between the two parties. In addition, the buyer should always clearly and explicitly communicate their requests to the seller so there is no confusion when the purchase order is received. Also, in the event the buyer refuses payment, the seller is protected because the purchase order is a binding contract between both parties. Lastly, some commercial lenders will use purchase orders as a reference to provide financial assistance to an organization. How Are Purchase Orders Different From An Invoice? Buyers draft purchase orders. Sellers, on the other hand, prepare invoices, once a payment has been received. In some cases, buyers are provided an invoice, with specific payment terms (ie. Net 30). Both the purchase order and the invoice contain similar details. The invoice generally references the purchase order number, along with an invoice number, in order to confirm that both documents contain the same information and correspond to each other. The main difference between the two is the technical details found on the purchase order are not included on the invoice. David the purchaser has been notified that a department needs a new set of desks. He creates a purchase order with the quantity and specific requirements (size etc.) for the desks. The company responsible for selling and manufacturing the desks then receives the order. Once they confirm they are able to supply the desks with the required specifications, they approve the PO and take the payment. Once that payment is received, the desks are shipped with a delivery date and an invoice is sent back to David the purchaser. The invoice confirms the payment was received, or alternatively, the due date of the payment. David then checks the invoice, the purchase order and the packing slip to ensure that all three match. Many organizations unwisely forego purchase orders because they perceive the paperwork to be a hassle that slows things down, or simply because they already have a working relationship with vendors. When businesses start small they tend to have an organic purchasing process. Over time, however, that process changes as companies develop relationships with their vendors. Once a company grows and the purchasing demands become more specific, urgent, and/or complex, communication challenges can arise if a purchase order isn’t used or certain details are not correct on the order. If a buyer receives their order and there is no purchase order to use as a reference, it can be a nightmare for both parties to determine where the request went wrong. At that point, it’s likely that both payment and an invoice was sent, which puts both parties in a significantly more complicated legal situation. A purchase order provides legal document and concrete instructions for the vendor, as well as a concrete audit trail that can be used as a point of reference for when things go wrong. Why Are Manual Procedures Inefficient? If your organization is currently using a paper-based procurement process, you are likely creating excessive documents. Most companies will process up to seven documents during a purchasing cycle. This includes requisitions, purchase orders, quotations, order acknowledgments, advice notes, goods received notes, packing slips, and invoices. That’s a lot of documents to produce – and keep track of – for a single purchase. As much as good record keeping is vital for effective and efficient purchasing and procurement, there are problems with paper-based records. Paperwork can easily be lost, damaged, or accidentally destroyed. It’s often hard to spot duplicate requests, purchases, invoices, or missing transactions – all of which can cost your company time and money. Using paper also requires an efficient and regularly updated filing system which consumes space and man hours in order to work effectively. Using an e-procurement software/purchasing system such as Procurify will digitize your entire procurement process (ie. electronic purchase orders) is a great solution to this problem. By having all of your important documents tracked in one centralized system, it’ll be easier for your purchasing department and accounts payable department. How Do I Integrate Purchase Orders Into My Business? You’re going to have to take a step back and observe how current business practice handles purchasing and, subsequently, envision how you’d like to control what employees can buy and how they process these purchase transactions. Assuming your organization doesn’t currently use purchase orders, it is also likely that you’re not managing the requests your employees make when they want to purchase something. Using purchase orders, especially through an e-procurement software/purchasing system will allow for efficient purchasing, control, and visibility into your company’s spending. Requisitions are a purchase order request your employees make for materials or items they need to do their job. Many organizations simply allow their employees to email a manager their request and then have that person make the necessary purchases. Adding purchase order requests creates two important benefits – the ability to manage a budget for employee spending and the opportunity to take advantage of volume discounts on large orders. Most organizations will allocate a budget to a purchase once a purchase order request has been submitted. You will need to create a standardized purchase requisition document, which all employees must then use. That standardized procedure ensures that receiving requisitions does not waste your employee’s time. As employees begin to draft purchase requisitions, you’ll be able to create an average monthly spend and track what your employees are purchasing. This means you can start analyzing how they use supplies and identify opportunities for savings. An approver will be the person managing the budget. If employees go over budget, the approver may not approve all the purchase requisitions that are not immediately necessary. Once employees begin submitting purchase requisitions, the approver can easily identify purchasing patterns. The approver can then submit bulk orders and request discounts if they are available. If the requests are created digitally, it can significantly reduce processing time because frequently requested items can be added to a catalog from the best supplier at the best price. Once requests have become a standard process in your organization, the next step is to create the purchase order process. This is likely as simple as contacting suppliers and informing them that from now on you’ll be submitting a purchase order before sending payment for goods. The supplier will likely be happy about this because it will significantly help both parties. Once your approver has some requests that need to be fulfilled, the purchaser will complete a purchase order and send it off to the vendor. The vendor, if necessary, will communicate any concerns or issues with the purchase, otherwise, they will ship the order and invoice once payment is received. Integrating both requisitions and purchase orders will significantly increase your ability to track expenses and remove a lot of headaches associated with employee/company purchasing. Visibility in your company’s spending is critical and this process will help you achieve that. What Do Purchase Orders Look Like? Purchase orders are, typically, a standard document. They generally contain company information (name etc.) and shipping details (address), vendor information (name and address), order information (product, price, and quantity), as well as additional details to the vendor. Many companies have a standardized purchase order document with stock information to ensure consistency. With Procurify, purchase orders look a little different. Instead of being a standard document, purchase orders are generated after a purchaser has compiled all the required orders for a certain vendor. General ledger codes are assigned to each purchase order, ensuring easy integration into your accounting procedures. I have a supplier that wants to know this: “Do you require a purchase order # before we accept an order?” So, I am guessing they want to produce a PO tracking number we will use on our PO’s? Thoughts? HI, i am wondering how long you must keep PO records? i work at a Hospital. and we are closing our doors permanently. i need to know how many years of Purchase orders I need to file for safe keeping by law in the state of New Jersey. Purchase order is one of the best evidence or confirmation to the seller that would be very s about from the buyer side that buyer is serious about to purchase the product and very genuine and can pay if we provide the credit to that particular buyer. HI, i am wondering how long you must keep PO records? i work at a Hospital. and we are closing our doors permanently. i need to know how many years of Purchase orders I need to file for safe keeping by law in the state of California. .
Hi Heather, you’ll need to keep them for 7 years. Hello. Am glad to know its 7 years in California. Should a PO have Terms and Conditions tied to it? Yes, Terms and Conditions are important as the Purchase Order is a binding contract between you and the vendor. If there is anything that happens to the transaction, the terms and conditions can help decide what the next steps are. Hope this helps! Hi, very good blog, I have red many blog on “purchase orders “. But your blog is very effective. what is the advantages of using one format of purchase orders? Could you please tell me what Raising the Purchase orders mean?? And what the procedure is in raising the purchase order? I am considering a start up company and nothing about PO’s or how to process them. My primary question is, How is a PO, processed, that is. Deposited into a Bank account ? Hi I have an interview and the question they asked was “What should be one of the first steps an accounts payable assistant should take when receiving a purchase order? Thanks for reading our blog and for your question – there may be more than one correct answer depending on the context and situation, and we believe you will be evaluated on how you justify your answer. This is quite an interesting question since from our experience, an AP assistant is not usually the first one to receive a P.O. If you are in AP and you do receive the P.O, I would send it to another department as an AP’s primary job is to pay invoices and not process orders. If there is no further context provided aside from the question and you have to be the one receiving, then the correct answer should be B – date stamp it. Usually, the best practice is that the P.O in itself should be date stamped beforehand. If not, that would be the first step to receiving. Date stamping is crucial because it is a record of when anything is received. It could be troublesome for the receiving company if they do not date stamp because they can’t determine when they got it and if that happens, it causes delay and expedited work. I received a P.O and I date stamp it for Jan 23 2018 and it isn’t due until Feb 14, so I put it aside for later processing if I have time. But closer to the date, I haven’t submitted it for processing and when the Manager or whoever receives it, they’ll question why it hasn’t been processed considering it was received on Jan 23. It would take more work to process it as fast as possible. Feel free to reach out to me at dani.hao[@]procurify.com if you have any further questions! Good luck with your interview. An accounts payable team should not receive a purchase order. It will usually be sent to the fulfilment/sales team (whatever that may be) within the organisation. That said, check it for a date stamp. If it doesn’t have one then date stamp it. That is always sound business practice. Dani’s example is a likely one but the bigger issue is receiving a Purchase Order much later than it was generated by the other company. If they then make a complaint to say the goods have not been dispatched promptly and the PO was generated months ago, you can quickly use the date stamp as evidence that it did not arrive. Excellent insight Thomas – thanks for sharing. I am looking for a software like this but as the vendor not someone placing the order. I am looking for a program that will require clients to place orders online so it doesn’t have to manually go through the account manager, accounts receivable clerk, then the department that will fulfill and ship the order. I want to minimize clients emailing orders over phone or email in random formats. Will this program work for that? Note: I am the vendor. A buyer gave us a purchase order for 10,000 tons of material. We made the material, and they say they are now only getting 500 tons. Are they legally bound to pay for the entire 10,000 tons? A mutually accepted purchase order can be treated as a legal document. However in your case, the terms stated on the P.O. are important to consider as normally you will have details about the delivery date and terms of payment. Who takes the liability after manufacturing and at what point can be a tricky subject between buyer and seller. I know it probably doesn’t help with the situation you are in right now but a good purchase order will detail expectations on both sides in case of a mishap. Rocky my comments are meant to explain what purchase orders are generally used for and should not be taken as legal opinion. You should seek legal counsel if you need to take the situation further. We received a purchase order for 2 units of machine. As per the conditions, the Buyer will pay 50% in advance and the remaining 50% will be paid upon the completion of the second unit. However, we have completed the production of the 2 units but when the first unit was delivered, they send us a notice of cancellation of the second unit. Can we hold them liable or force them to pay the complete amount of the purchase order? Apologies for the late response, Rene. I can only answer from experience; in any event, I would encourage you to take your query to a lawyer as they would be ideally suited to answer your question. From what I understand, a purchase order is a legally binding document. Once accepted by the vendor, it stands. Unless otherwise stated on the PO (Many POs come with a list of terms and conditions that establish the protocol that is to be followed in situations such as the one you find yourself in), both buyer and vendor should ideally agree on changes in the order before either party decides to make a change. In your case, it seems to me like the buyer decided to change the order merely by notifying you, as opposed to coming to an agreement with you about the said change. The comments on this article are great! Between the simple, clear explanation the article gives and the rich, 1 in a 100 situations detailed in these comments this is an awesome manual on POs. I have a few issues that I need clarification on best practice. First issue; What if the $ amount of the service needed is unknown and the vendor can’t provide a quote before the work is done? For example, we have a few vendors we use to fix equipment and provide custom metal fabricating, but the necessary repairs/work is unknown and could vary between $200 and $5,000 depending on what is broke and how much labor it takes to fix/fabricate. Its only after the work is completed that we actually know the cost, at which time we have already incurred the liability to pay for anything they fixed/fabricated and at whatever price they charge. These vendors are apparently the only ones in the area too. Second issue; operations also regularly doesn’t enter requisitions to purchasing for them to order because they do not trust that they (purchasing) can convey the needed info or answer any questions to order effectively. I have personally seen some of their requisitions and they often do not contain the necessary information to order effectively, but the time it takes purchasing to clarify has been used as an excuse to not order through purchasing. Operations always replies that they can’t have the plant shut down due to delays in ordering. Third issue; we currently do not have enough staff for there to be a dedicated receiving individual, so currently everyone is receiving in the system their own orders. I would like to segregate this to a separate individual independent of the requesting and the ordering responsibility, however trying to implement something without a receiving person has proven difficult. I am trying to implement policies to ensure proactive POs and segregation of duties, but these issues are being used as reasons for not following these policies. Your first issue is an issue of cost control and should be looked into quickly with the aim of developing a strategy. It is not reasonable to give a supplier carte blanche on costs like this. You should seek to move them away from a time and materials agreement to a collared and capped rate. That being said, if you can’t do that, they will need to raise the PO for $5,000 with the explicit instructions to the supplier that this is not what you are paying, but what you will pay up to once the invoice is received. Your second and third issues need corporate sponsorship. It sounds like you need to build a case as to why you should be using purchase orders and then get the required resources and authority to prevent people going off policy. Do you have any office in Melbourne, Australia ? I would like to query about Procurify soft ware . Hi there! We don’t currently have an office in Melbourne but we can definitely have someone on our team reach out to you to talk. What number can we reach you on? Pls send it to me at nitant@procurify.com, and we’ll contact you shortly. I am a buyer for my company. We sometimes receive requests to create a purchase order after an item has shipped. Do you know if there is a standard business practice related to this? Are the rules for purchase orders and non purchase orders the same? If someone needed to order something as a non purchase order (NPO) would they follow the same procurement rules such as getting it approved if over $5,000 before submitting an order? Are there repercussions for such? Thanks for reaching out, Donna. From what I understand, Non Purchase Orders are used when someone in your company needs to order something urgently. Because of the urgency behind it, NPOs — unlike standard POs — may not be placed for approval before the the head of the department, the CFO (or any of the parties that are designated as approvers). Coming back to your question, I think it’s prudent to note that NPOs typically come with limits. In your case, the limit is $5,000. What this effectively means is that you may be allowed to make a purchase using an NPO as long as the cost of the product you are trying to procure is under $5,000. In other words, you may be allowed to purchase the product without seeking any approvals first. But before taking such an action, I would first make it a point to check with whoever is in-charge — either the CFO, Purchasing Manager, Procurement Director, Controller etc. I would also strong recommend against using NPOs. That approvals take a long time to process is an erroneous belief, unless you are using spreadsheets, email or a paper-driven process that is inherently slow. With modern spend management solutions like Procurify, you can actually get anything approved in a matter of seconds. I have a tricky situation. I recently quoted a company for a 2 services, which they accepted however followed through with a PO for 3 services. The PO included details of where it was to be completed and what was to be completed, however it did not state any pricing information. So as quoted we carried out the 2 services as we originally agreed, however they are now stating that as the 3rd part is not complete they are withholding payment. So I have 2 scenarios 1) Do I demand payment as we originally only quoted for the 2 services and that was our original agreement (even though the PO differs) or 2) Do we complete the 3rd service and raise an additional invoice (completing the PO in full but as there is no price on their PO there is no clear pricing structure only on the previous 2 services from our quotation)? Thanks for reaching out, Amy. Before I venture my opinion, could you clarify something? Are you saying that the second PO included the prices of the first two services, and mentioned the third service without specifying how much it would cost? If the buyer placed order on the Seller and seller send the Sales Acknowledgment to the Buyer. After the three months material is finished and at the time of Dispatch, if any confidential document is required by the seller and in this case if buyer is not in position to provide the same. if Seller cancel the order from his side, than is buyer is liable to pay the charges incurred in manufacturing the material. AT the time of placing the order, seller has not demand this Confidential document. Hello thanks for writing! Currently working for a small start-up an we are new to PO’s we have a large PO for 200k Units, it has 4 different PO’s for this order each getting delivered at a different time, my question is can they “cancel” there existing PO before delivery? Thanks for reaching out. From what I understand, a Purchase Order becomes a binding contract the moment it is accepted by the vendor — to this end, it is best to furnish the buyer with a proof of acknowledgement that the PO has been accepted. In an ideal world, the only grounds to cancel a Purchase Order should be either non-delivery, defective or incorrect products, or any other lapses on the part of the vendor/supplier. However, as it happens, many companies do end up cancelling POs because they suddenly realize that they ordered the wrong product, or do not need it, or can’t afford it, or, worse still, because they found a better deal. These things happen. And there’s little the vendor can do, particularly when he has already committed to the deal, apart from getting into an argument with the buyer and threatening him with legal action. To avoid such quandaries, it’s essential to account for such situations in the Terms and Conditions of the PO itself. The vendor must insist that the Purchase Order contain details of what would be the course of action should undesirable situations, such as the ones described above, arise. This would help both the vendor and buyer have a clearer understanding of the agreement they are getting into. Hi, in need of some help please. I am a small limited company hiring equipment to offices. presents i only receive orders via text messages from managers on site but not the owners them selves. after the use of equipment i invoice them via email. My question is in my situation do i need a purchase order from them or any other kind of provable communiction in case some one decides not to pay. I only hire for a day or two but i dont sell anything. Thanks for reaching out, Zangaz. Ideally, the businesses that you are dealing with should be routing all their purchases through the purchasing manager; in more process-driven organizations, managers place a request (either for a good or a service that their team needs) with the purchasing manager, who then accepts the request and writes out a purchase order that is then sent to the vendor. And yes, purchase orders, as your rightly said, are probably the best proof of purchase. But your situation may be a bit more complex; if your client businesses prefer to use on-site managers to place orders with you, it means they either lack the resources to hire a purchasing manager to do the job, or simply prefer not to. The latter case is not uncommon; in many companies, particularly those in the construction industry, the site or field manager needs equipment or services immediately — he doesn’t have the patience or the time to either place requests with the purchasing manager or write a purchase order himself. However, most companies of this kind do not realize that with the right of kind of purchasing software (like Procurify, for instance), writing a purchase order is as simple as sending a text message or updating your Facebook status. Given the constraints in your situation, you may not want to insist on the use of purchase orders. Maybe openly communication your concerns about the important need to have proof of purchase would help your clients understand the value of purchase orders. Is there an industry standard regarding what items need to go on a purchase order? For instance I understand high dollar items and inventory are needed for a PO, but I don’t cut a PO for utilities. I’m also finding our production department wants me to place a PO for tools – sometimes for only $10.00. I’m trying to create parameters regarding what Purchasing cut’s PO’s for and what they shouldn’t. Any thoughts? Thanks for reaching out, Erik. I think it’s great that your company is taking such a proactive approach with their purchasing — hence the insistence on using POs for every purchase. At the same time, I do understand that it can become highly cumbersome to write out a PO for every little thing — especially utilities and tools which cost very little money. My suggestion would be to break down your spend into categories — utilities could be one category, tools another, raw material yet another — you get the drift. After you’ve broken down your spend, you would know how much you spent, for example, on utilities in the last fiscal year. You can use this data to have a fair idea of how much you would end up spending this year. Once you’ve done this, you will no longer be required to create a PO for every tool or utility that you need to order. Instead, you can order all your tools using one consolidated purchase order at one go; I wouldn’t recommend doing this for every spend category — just the ones where prices are low and the goods/services are related. Besides saving your the trouble of writing a purchase order every time, this system would put you in a more favorable position to negotiate discounts with your vendor since you are now placing a larger order. This can be hard to do manually. But spend management solutions like Procurify can automatically categorize your spending, give you a bird’s eye view of your spend and hand you back the reins necessary to take control of your company’s expenditure. Thanks for the comment, Yousuf. And good luck with your job. I was a buyer at a company I am no longer employed at. The company is still using my name on the purchase orders as the buyer. Is this legal or a normal practice. I know this because my new company received a new order with me as the buyer. They questioned me. This is really strange practice. When someone leaves a company, the organization typically revokes your email and other accounts you may have. They should remove you from the purchase orders as you are no longer the person representing the company’s best interests. From a communication standpoint alone, it seems this would only serve to cause more frustration and confusion between all parties. Great to hear you’re trying to solve this problem early on. The best way to match up your orders to what you’re receiving while maintaining information for when you need to make a payment is through three way matching. It sounds like you are already doing three way matching (matching invoice numbers to purchase order numbers to shipping/receiving documents). There’s always a tradeoff between cheap, fast, easy. The “fastest/best way” is to centralize your records in a dependable and easy to pull up system. This way you can easily keep everything organized, make sense of your data, and catch errors as they occur. If you’re just starting out you might want to try creating a spreadsheet to manage your purchasing. If you need something more robust or that can scale to fit your organization as it grows, I would recommend looking for a software solution. I run a consultancy firm and am about to do some work overseas. The company I am supplying to is asking if they should raise the PO in their currency or mine but I’m not sure of the answer. My quotes for the work have all been in their currency. Even though your quote was in their currency, you will have to ask yourself “Which currency do I want to be paid in?”. If the answer is your currency, then the purchase order should be in your currency. On their end, purchasing best practices call for the currency on the purchase orders to match the currency on the invoice. Nick makes some great points regarding your situation. The purchase order is meant to act as a communication tool between the buyer and supplier. Another benefit of using purchase orders is it helps to clear up confusion and potential misunderstandings before companies commit to spending money. In this case, you’ll want to clarify with the supplier which currency you will use to determine price. (This can be favorable if you pick a currency that falls). When you issue a Purchase Order you are representing the interests of the buyer. The seller still has the right to accept or reject the purchase order if they deem the terms to be unacceptable (or simply want clarification). You can try to make purchase orders more favorable (currency, shipping terms, insurance terms, etc.) to the buyer but it just depends on the situation. Please i need your advice. I own a small company as a supplier. The buyer sent me purchase order with conditions for my company to supply the goods within 5 to 8 weeks and invoice to receive payment with 45 days after the invoice. My company is not the manufacturer of the product. My question is it possible for the manufacturer to accept the PO and supply the goods to be paid after the I receive payment. Theoretically I don’t see why a manufacturer would not be able to do this. It just depends on your agreement with the manufacturer. A lot of manufacturers will want a certain percentage up front to cover their risk (likely the minimum would be their cost) but you can negotiate for different terms if you develop a relationship with them. Relationships really matter when it comes to procurement. My boss Irwin Prescott ask me to research the new policy for purchase orders for sub-consultants, both new and old. He has three very large contract with multiple subs (the client is Florida Department of Transportation). The projects have been going on for years and all the necessary contracts are in place. Is there a change of policy that is coming out first of the year. If I need P.O.s is there a date where that it is necessary and all prior contracts are grandfathered in? I think we need to clarify the situation a little bit further to understand what you’re asking. There might be a change of policy but I don’t have enough context to be able to weigh in on that. If there are POs pending then the terms would have been stated in the purchase order if contracts were grandfathered in. Ultimately you should treat purchase orders as an agreement between two parties: buyer and seller. If one party is not clear about the details of an order, you are likely to have a dispute. The value of procurement officer or purchaser is not just cost savings but clearing up and effectively communicating to vendors what is desired. Hello, could you please advise me regarding our situation. We are a small company and we sent a purchase order to a seller who was to provide us with a certificate. During few month, for various reasons (we could not provide the correct documents), the certificate was not provided. Our seller insist on being paid, based on a fact that he has spent few months negotiating and consulting us. Are we obliged to pay in any event? Thank you. If the seller has a copy of a signed PO it technically can be used a binding contract. If your purchase order indicated that the certificate was part of the suppliers obligation to receive payment you could make the case the supplier did not meet their end of the bargain. The reason you want to keep your purchase orders organized with a standardized process is to avoid situations like this. There are times when what you receive or what you are invoiced are not aligned. You can point out the original PO to correct the situation. This really depends on your organizations unique process. If you’re using a paper based purchase order system it would be a good idea to leave a copy with the purchaser, give one to the receiving department so they can match it against the shipping document, and one to the AP department so that they can match it against the invoice. Having an electronic system would greatly improve the organization and storage of supporting documents. Everyone could then access the files online and it would allow you to three way match much more efficiently. Plus you could reduce the time everyone needs to spend creating paperwork, filing it, and then trying to dig it up during audits. Your filing cabinets will thank you. Hello, could you please let me know which department at the company should request and collect the Purchase Orders? we have an international department, which is mostly interested in sales forecast and provide the updated 3 mnth forecast figures to the common server, opening for the all relevant depts. Based on the provided sales forecast which department is responsible for PO and should ask the customer or remind them to send PO for the upcoming month and collect these POs? many thanks. Thanks for reaching out, Lale. The department that is directly dealing with your customers should ideally be held accountable for both receiving and storing Purchase Orders from your buyers. To ensure a clear audit trail, this department should also insist that the customer issue a Purchase Order for and, more importantly, prior to every transaction with your company. It might be, understandably, difficult for your customers (or buyers) to issue a PO for every purchase they want to make and this is because often times, their buying needs may be routine, repetitive and urgent. With an agile spend management solution like Procurify, your vendor can consolidate a large number of such needs into a single Purchase Order in seconds. In my experience, vendors and suppliers can only do so much to ensure that their clients follow proper purchasing procedures — this is one of the reasons why we, at Procurify, are trying to transform the Spend Culture of companies so that they are able to purchase better, smarter and more easily. A Purchase order was raised once but sent to a supplier twice, with the exact same details, in error. The supplier then delivered the goods twice and have said that we cannot return the items as they are specifically made. They have therefore invoiced us twice. I have paid both sets of invoices as the account was put on stop due to non payment. I need to know where we stand legally as to whether we can claim the money back as surely that is the point of a purchase order? Thanks for reaching out, Tracy. And sorry to hear about your situation. Do not consider this any kind of legal advice because I’m not qualified to offer it. I will say that typically every Purchase Order should have a unique identifier (i.e. the Purchase Order Number) printed on it. Ideally, the invoice, issued by the seller, should reference the PO number as well. 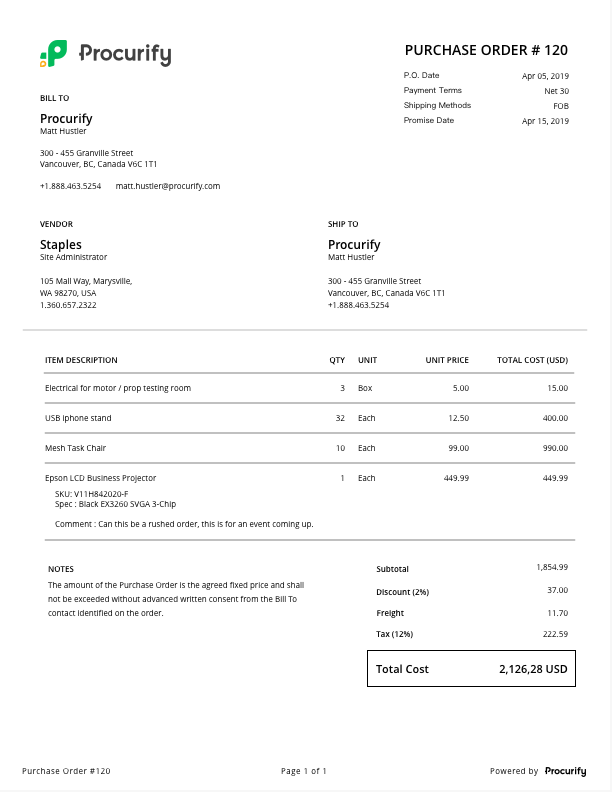 If your Purchase Order had a unique PO Number on it, it would have been easier for the seller to realize that the order may have been erroneously duplicated, at the time of generating an invoice for it. The “Delivery Date” on your purchase order should reflect the date that you actually require the goods to be on your job site/in your warehouse. When a purchase order is generated automatically for replenishment, the factors that are taken into consideration are the suppliers standard lead time for the item, as well as number of days until current inventory is exhausted or the item is required to fulfill a work order. In most cases, a supplier will look at all of the items on a purchase order and attempt to fulfill the order complete. In some cases, this means holding up items on hand until other items are available. Depending on the relationship that you have with your supplier, they may call you and ask if you want to hold the order and ship complete, or if there are items on the order that you require right away they can ship partial. Best practices indicate that when you send a supplier a purchase order, the supplier will review the order and send back (at minimum) hand written beside each item on your purchase order the quantity currently available to ship and the date that each item can be shipped. Especially in the case of backordered items. Your next move is to communicate which items you require immediately or can wait for and/or let the supplier know that you are cancelling the item(s) that are backordered or the entire purchase order to order from a different supplier that can deliver these items in a timely fashion. The suppliers “interpretation” of the expected delivery date on your purchase order is just that. The date that you expect the items to arrive at your site. If you are having difficulty with the supplier delivering to your required dates, you may have to ask 1. if you are allowing a reasonable amount of time from source to destination 2. Speaking with the supplier to learn if they have changed their business practices and are now “making to order” rather than carrying inventory 3. have they changed shipping companies 4. Do you have a contract in place with the supplier stating that they must carry inventory on your behalf 5. Any other changes that are affecting delivery? Finally, shipping windows are typically used in cases of low dollar value low criticality items that orders can be held and shipped together on a regular frequency. Such as all items from Supplier A can be batched and shipped the last Friday of the month. I am an intern at my company and currently am working on a project and have some questions. I work as a buyer for my company which has a large warehouse. The goal of one portion of my project is to see how our suppliers interpret our purchase orders to determine if we should stick with a general due in DC date or go to a shipping window? I was just wondering if maybe their was a standard on how purchase orders are interpreted from the supplier side? Like what verbage is normally used? What is the typical terminology on when their order is due? Right now we just have a “promised date” which we interpret as the date its due in our DC. We feel that suppliers may interpret this differently. Would you know a good place to look in regards to industry standards regarding these issues. Purchase orders need to be signed by both parties, With out signing means that you have not agreed to the terms and condition and there is not a bonded document between the two parties. If we look at a purchase order as a contract then it would make sense that the document would need to be signed by two parties. If one party were to sign it first then send it off to the 2nd party, the first party would essentially be agreeing to the contract but the purchase order wouldn’t be binding until the 2nd party signed as well. Nevertheless, the first party to sign should treat the PO as binding regardless of the action of the 2nd to minimize risk. which department of any organization makes and maintains the purchase orders? Either sourcing department or planning department? It depends on the organization – but typically it is done by the purchasing/procurement department, operations or finance. I believe planning should do it, they would gain ownership and relay on themselves for the delivery on time of the orders and sourcing can focuse on strategic projects and savings. what does the experts think about this? Dear Sirs, sorry, in my last email: ‘often don’t any acknowledgement’ should read ‘often don’t send any acknowledgement’. As MD of my small engineering company, I write out Purchase Orders as outlined above but often the metal parts suppliers that should be producing the parts I request, don’t produce the parts on time (if at all) as detailed in my Purchase Orders. 1, what is legal ‘acceptance’ of my Purchase Orders? IE small engineering companies often don’t any acknowledgement, but just produce the parts and phone me or wait for me to ask if they have produced the parts yet. So, I guess if no definite ‘acceptance’, my POs are not legally binding on these suppliers? Is that correct. So what is ‘acceptance’? 2, How can I make these suppliers hurry up and produce the parts in the time stated on the POs (and initially verbally agreed dates by phone before hand) and can I apply penalties? Thank you for your questions, and thank you for being so concise. In answer to your question: “How can I make these suppliers hurry up and produce the parts in the time stated on the PO’s” It’s not so much about making them do anything as it is to know where you stand and be clear from the start. I would highly recommend having a clause on your PO that states: “All items listed on this PO are required by (date) in full. IF you are not able to provide all of the items listed on this PO by the date, advise us immediately and do not accept this order” Another term that is used, though not as well is “Time is of the essence for the delivery of this order” and finally, you can impose penalties for non-performance as long as you have those terms listed on your PO and they have signed acceptance of the order. I hope this helps for your future orders. The Best practice is always to have good relationships with your suppliers and have them clearly understand what it is and when it is you need from them. You are not alone, this same argument comes up with quality of product delivered issues. Can a buyer / purchase in charge verify invoices ? I am a buyer in my company and I am being told to verify invoice and the finance rely on making payments based on my verification. Is it a good practice ? Yes, as the buyer, it’s good practice to verify invoices before payment. The buyer is the best person in the organization to verify if the invoiced goods/services match with what the company requested (quantity, unit cost, etc). 2. An AMC for 3 years post warranty period. My question is that since I have delivered and invoiced for one item in the PO, is it required that I provide the second item? Can I refuse to enter into the AMC agreement and not raise an invoice? First off, this should not be taken as legal advice. It’s just my understanding of Purchase Orders. Creating a purchase order is really just the first step in the purchase to pay process. The PO protects the seller in case the buyer refuses to pay for goods delivered or services rendered in the future. A purchase order doesn’t bind the vendor to produce a good unless further contracts are signed or other agreements are made. A purchase order is an expression of interest from the buyer that they desire a good or service from a particular vendor. The Purchase Order would still need to accepted by the vendor or seller. You can refuse to accept purchase orders. If you already accepted the terms for the two items then breaking the agreement for the second item may cause problems. You may run into legal issues, with punishments set out in the agreement, usually in the form of a fine. Do purchase orders require terms and conditions? I mean, could someone just write something on a napkin, sign it, and call it a purchase order, and it would be a legally binding contract? Not sure if it matters, but I’m in California. A purchase order does need terms – specifically types, quantities, and agreed prices for products or services. What makes a purchase order a legally binding contract is its acceptance by the seller. So, technically speaking, if you included the aforementioned details on a napkin and it was accepted by the seller, it would be good to go. With that said, you might have a hard time convincing a seller to accept a purchase order in such a form. Purchasing best practice is to use a standard purchase order form – such as the one electronically generated in Procurify – for all purchases. could you please elaborate on the ‘acceptance’ part. Does a PO need to be signed buy the vendor, or what is meant by ‘accepting’ the details? The answer is — there is no fixed way to accept a Purchase Order. Different vendors, buyers follow different procedures; it is, however, crucial that there is utmost clarity between the buyer and the seller on whether a Purchase Order has been accepted, or not. And that is only possible if there is a clear line of communication between the two, and records or documentation to prove that both the parties have clearly understood each other. In most cases, the buyer sends the Purchase Order; the seller receives it, and then either emails or faxes, or snailmails the buyer to indicate that he accepts the Purchase Order (along with the Terms & Conditions mentioned in it). Alternatively, the seller can contact the buyer (using communication that can be legally recorded for reproduction later, should something go wrong) and establish that he disagrees with a part of the order, and that he would be unable to process it unless the buyer is willing to make concessions or changes to it. Either way, email, fax, or any form of “written” communication is essential to not only convey to the buyer that the PO has been accepted/rejected but to also establish on record what transpires between the two parties. Thanks for the information, No doubt that purchase orders is important for our business. We must keep in our mind.